Oracle DNS server query rate. 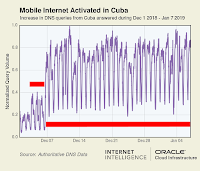 ETECSA, Cuba's government monopoly ISP, is offering a number of stopgap Internet services -- navigation rooms, home DSL and public WiFi hotspots, but the recently rolled out 3G mobile service is the most important. 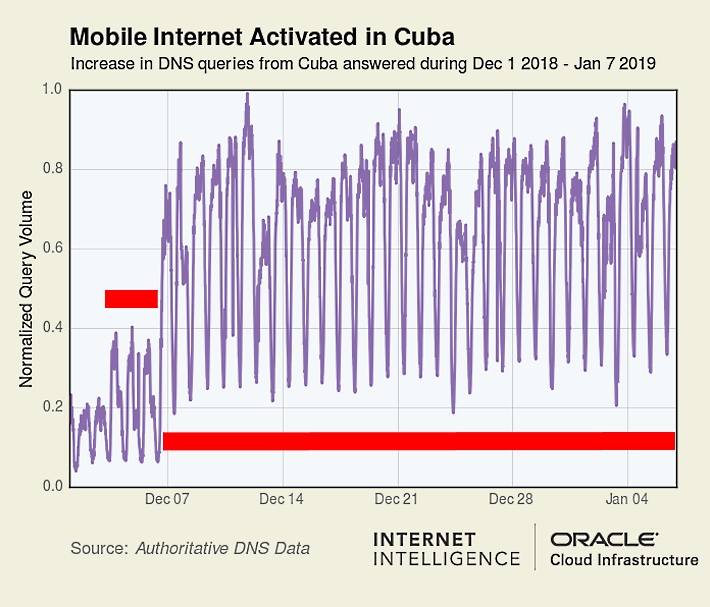 The plot to the right shows the normalized rate of Cuban domain name requests to Oracle servers during the first full month of operation -- a surrogate estimate of Internet traffic volume. During the limited 3G rollout period of December 4-6, DNS hits were roughly double the previous level. When the full rollout was complete, Oracle DNS queries doubled again -- roughly 4 times that of the pre-rollout level. 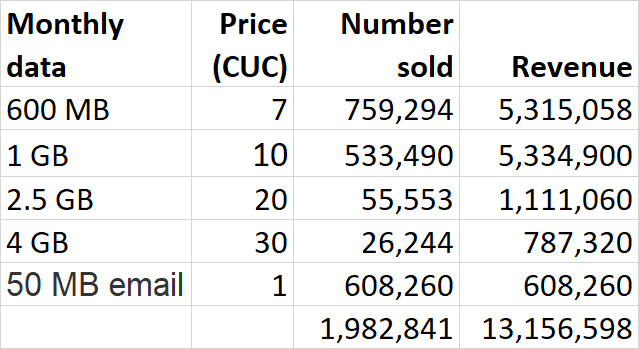 ETECSA released 3G mobile sales data for the first month at the recent National Workshop on Computerization and Territorial Cybersecurity and the results were impressive -- there were nearly 2 million transactions and the revenue was over 13 million CUC. I have argued that as soon as they have the capacity to handle the traffic, ETECSA should cut 3G mobile prices and eventually make this slow, obsolete service free. Doing so would expand and train their user base and lead to the development of new applications. For example, a month after the service was introduced, Sube, a taxi application similar to Uber, but with cash payment directly to the driver, is available. While free 3G would cut into ETECSA revenue in the short run, Cuban Internet policy should be determined by social and economic goals, not ETECSA profit.